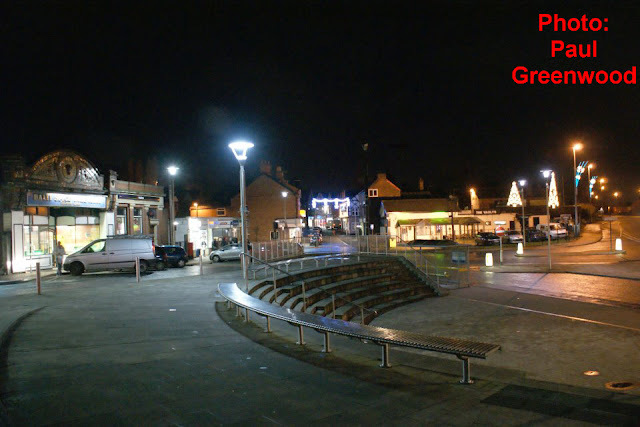 Paul Greenwood took this atmospheric night time shot when out and about with his camera on December 7th 2011. The photo is taken from the top of the amphitheatre and we are looking in the direction of Wheelock Street. The sweeping curve of the amphitheatre itself is seen to good advantage in this view and, in the middle distance, are the lights of the town's main shopping street, also captured by Paul a few days earlier in this equally atmospheric shot. On the left is the Balti Spice takeaway, once one of the town's most attractive shops, and next to that is the part-time Middlewich branch of NatWest. Then comes Tesco Express, oddly competing mainly with the Tesco Supermarket on Southway, just a matter of yards away. Pineland now occupies the remaining part of the long low building which started life in the early 1970s as the 'Co-operative Superstore'. Centre right, The Vaults provides an oasis of warmth and light in the early evening gloom, and to its right we can see some of the town's Christmas lights receding into the distance along St Michael's Way. Sharon Barnard Love this pic! Dave Roberts Thanks Sharon. Paul's a pretty talented photographer, isn't he?